Eric Michiels, Maccaferri’s global head of mining recently presented on basal reinforcement over voids at the National Association of Abandoned Mine Land Program’s 29th Annual Conference in Lexington, Kentucky. Quarrying often occurs in urban areas, leaving abandoned mines an eyesore and, at a minimum, a dangerous site. These mines are often left as massive holes in the ground or cuts into mountainsides. Falling debris is often a significant threat as is falling from a vertical high wall or drowning in a pool of water that has developed. Reclaiming quarries present an opportunity for development of commercial, residential and recreational activities, but first one must address these ever-present threats. Many developers are looking to fill in these areas. Structural fill is often expensive and oftentimes less care is employed when installing organic or other materials. This backfilling practice often creates voids in the backfill making the material susceptible to settlement. In the United Kingdom, developers have twice called on Ultra High Strength geogrids to bridge the voids beneath a subdivision built on an abandon quarry. Another developer in Turkey is also employing the same solution beneath 600,000 sq meters of development. Ultra-High Strength geogrids present tensile strengths up to 1500 kN/m, or 50-100 times more than traditional geogrids. These geogrids have been used in the US to bridge sinkholes on highways and transfer the loads in pile caps. This technology may offer a cost-effective way to bring closure to some of the mines in the United States. Maccaferri’s Para-Family of products includes wide range of geogrids to solve any challenge. 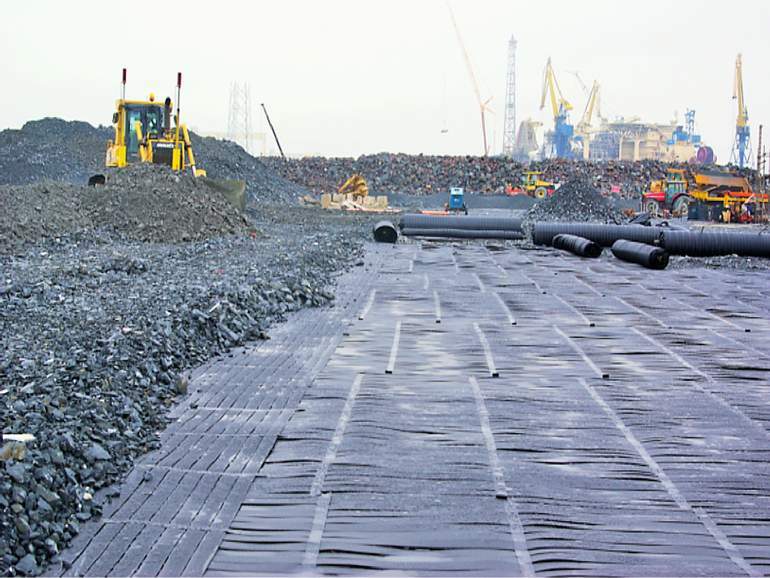 Maccaferri’s ParaLink® is the strongest geogrid in the world, offering a 120-year design life. The incredibly tough polyethylene sheath is resistant to physical, chemical and biological conditions found in reinforced soil structures. Read the full case history here.